Heat relief is just around the corner! 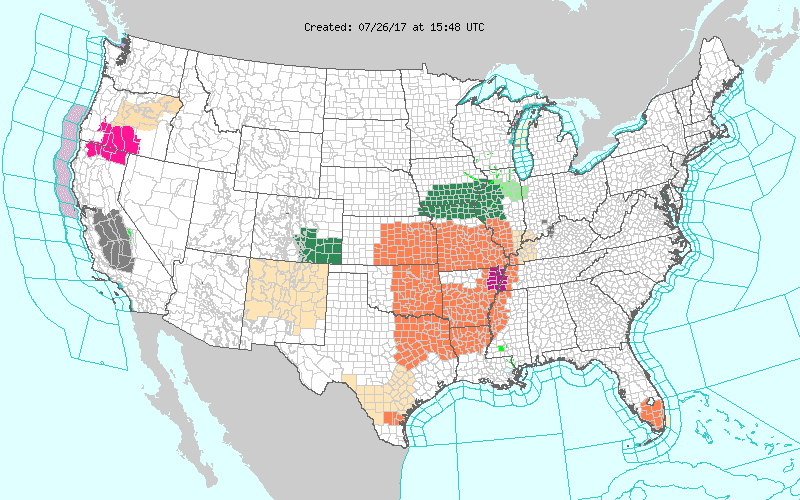 Heat Warnings and Advisories are in effect today and Heat Advisories continue into tomorrow. But there is actually great news just around the corner! We'll start with the bad news first, though. A large ridge of high pressure remains firmly in control of the weather pattern locally and, in fact, for much of the south-central U.S. With few clouds and nary a cooling shower to be found (most likely), temperatures will rocket back into the mid 90s today, reaching a forecast high of 97° in Memphis. Coupled with humidity that we've grown weary of (dewpoints well into the "humid" to "miserable" range on the Muggy Meter), heat indices will reach the mid to upper 100's, perhaps as high as 110°, this afternoon. 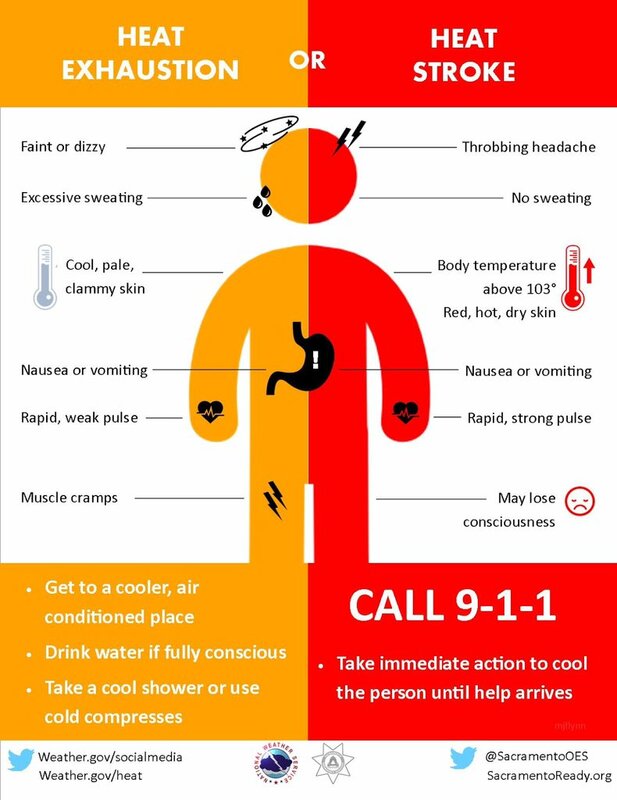 In addition to heat, the "cap" provided by the high pressure ridge and light wind has resulted in a Code Orange Advisory for elevated ozone levels, per the Shelby County Health Department. If you have respiratory issues, stay inside this afternoon until sunset. On Thursday, conditions will be similar to today with regards to the heat and humidity levels, however by mid-afternoon we could start to see some more clouds and perhaps a few showers or thunderstorms. But there is reason to rejoice... because it'll be the last day with 105°+ heat indices for some time! As the front gets closer, thunderstorms that form ahead of it late Thursday will move south into the region. By dawn Friday we will probably be dealing with scattered to widespread (and welcome for those who weren't under the storms that formed Sunday afternoon) showers and thunderstorms that continue into Friday morning and perhaps the afternoon hours. A few storms could be strong to severe ahead of the front. Clouds and precipitation will likely hold temperatures below 90 degrees, though it will remain humid. The cold front itself moves through by late afternoon Friday (if not earlier), bringing precipitation to an end. In the wake of the front, much cooler and drier air will filter into the Mid-South this weekend on northerly wind. Sunshine will be abundant, dewpoints fall as low as 60° (as compared to the mid to upper 70s we've had the past couple weeks), and temperatures remain in the 80s for highs as morning lows drop into the 60s. 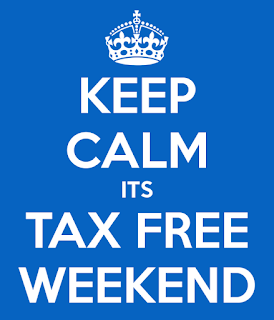 And it's all tax-free!! The general pattern of cooler than average temperatures and dry weather continues into early next week before we start warming back up a bit. But for now, I don't see a need for any Heat Advisories after tomorrow for a while! This map by Brian Brettschneider shows the normal midpoint of summer for a given location. Here in Memphis, it's around July 17 according to the data. We're slowly making progress towards fall! 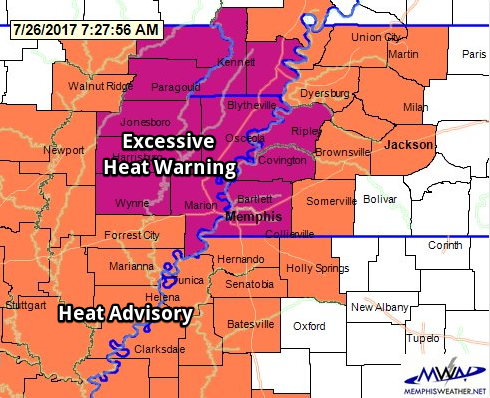 What this means is that the average "peak" of summer heat here in the Memphis area is now in the rearview mirror. We're on the long downhill slide towards autumn. But summer is certainly not over yet! A sprawling high pressure system at the mid and upper levels of the atmosphere is responsible for bringing the heat the past few days, while surface high pressure just to our east has allowed Gulf moisture to pool over the region, creating a very humid airmass that has exacerbated the hot conditions. UPDATED 3:00PM: An Excessive Heat Warning is in effect for much of the metro through Saturday evening and Heat Advisories remain in effect through Sunday as temperatures rise well into the mid (and for today, perhaps upper) 90s. Heat indices are averaging near 110° at mid-afternoon as the humidity has cranked up as well, evident in dewpoint readings in the upper 70s to near 80. As high pressure aloft weakens this weekend, the heat will abate just a bit, as well as allowing rain chances to increase a bit, especially during the afternoon hours. Humidity will remain high, but with temperatures still in the mid 90s through Sunday, heat indices will remain above the 105° danger level. A few afternoon t'storms are possible Saturday, then scattered thunderstorms are expected on Sunday into Sunday night. 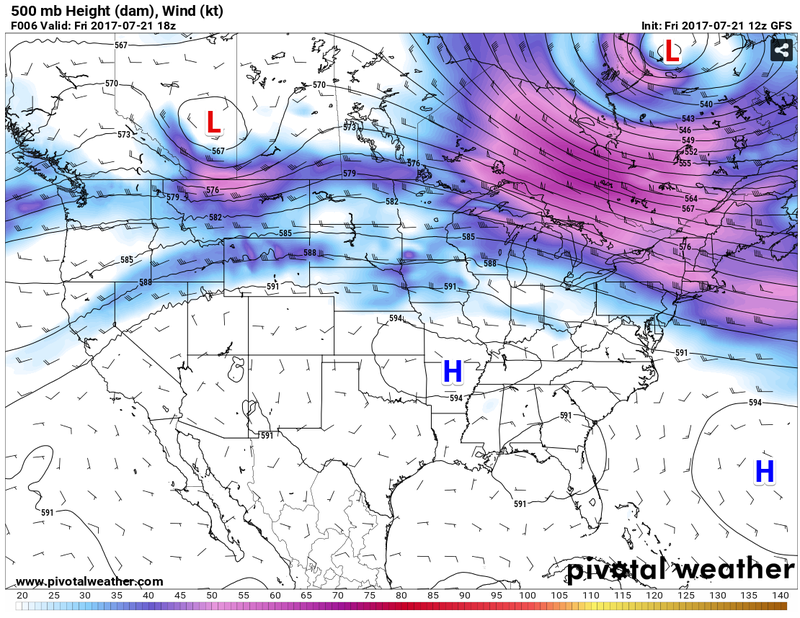 By early next week, our high shifts further east, a trough of low pressure develops in the Great Lakes region, and another high forms in the western U.S. The overall impact on our weather is that we'll be in a "northwest flow" pattern, meaning the wind aloft will blow from northwest to southeast. 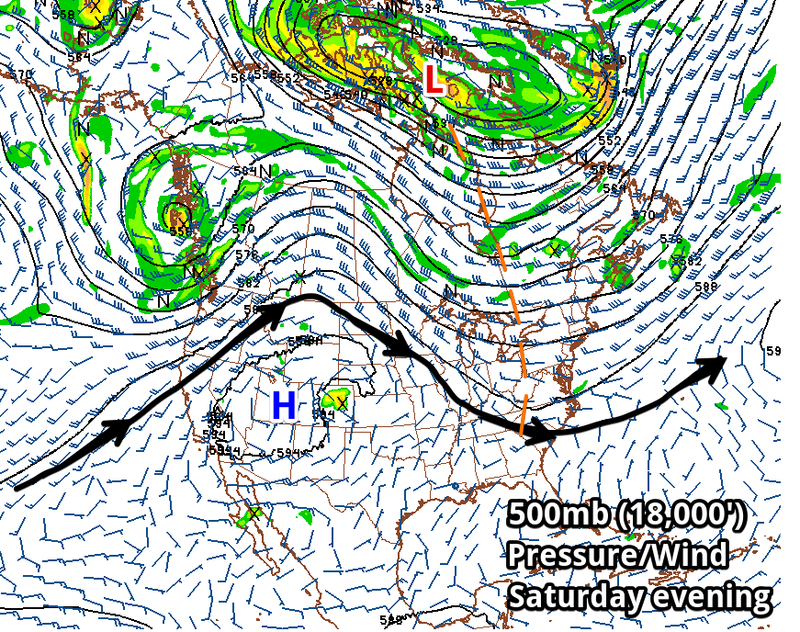 This is a pattern that favors upper level disturbances to move across the region from the northwest. In addition, a cold front will sink into the Mid-South by Tuesday, but stall out. This combination means the likelihood of scattered showers and thunderstorms to start the week, holding high temperatures down closer to 90°. Humidity remains of course, making for a muggy forecast. By mid-week, high pressure to the west begins building back into the region, the front lifts back to the north, and temperatures warm back up into the 90s. We will likely still see a few daily thunderstorms typical of summertime but the storm track should shift back a bit north of the metro by Wednesday or Thursday. But as I said at the top of the post, we're slowly getting closer to autumn than we are moving into the heart of summer! Schools start in a few weeks, which hopefully means the warmest part of the year will soon be behind us! 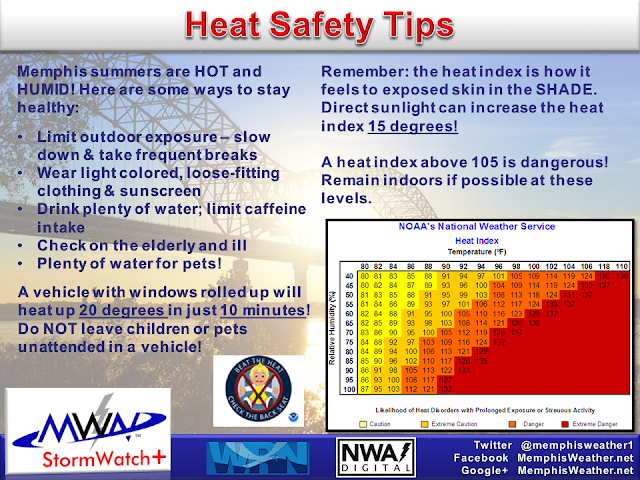 Summer has definitely arrived in the Mid-South as temperatures are now consistently rising into the 90s each day. We've also seen dewpoints rise to mid-summer levels, pushing the heat index above 100 degrees each afternoon. 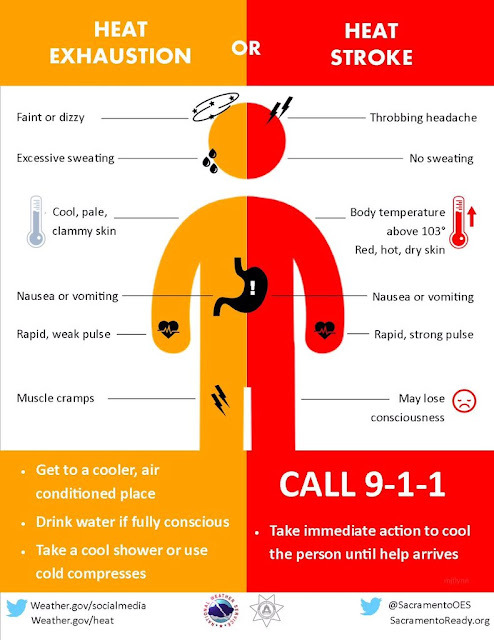 Be sure you are taking precautions against the heat - drinking water, checking on the young and old, and avoiding it if possible! With the increased heat and humidity came a few popcorn showers the past couple of days. Unfortunately (if you want dry weather a little longer), rain chances will increase even further heading into the weekend as a front sags south. 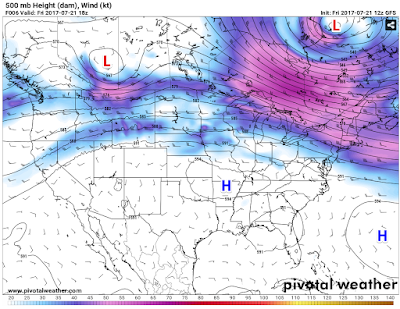 An upper level trough develops over the eastern U.S. in response to a building ridge of high pressure to the west, placing the region in northwest flow that promotes the passage of upper level disturbances. All of this adds up to: 1) slightly cooler temps due to increased cloud cover, 2) continuing high humidity, 3) higher rain chances, but 4) "marginal" severe weather chances. For those trying to plan outdoor events, I believe the best chance of thunderstorms, when a few could contain gusty wind as represented by the level 1 "Marginal Risk" of severe weather donated above, will be late Friday afternoon into the evening, and mainly north of the city. As shown by the afternoon run of the high-resolution NAM model below, an area of storms may fire up to our north and head towards the Memphis area late in the afternoon, but this model believes it could quickly fall apart heading into the evening. The afternoon run of the NAM3 model from 1pm Friday to 1am Saturday shows a potential line of storms dropping towards the metro but falling apart as it gets close. 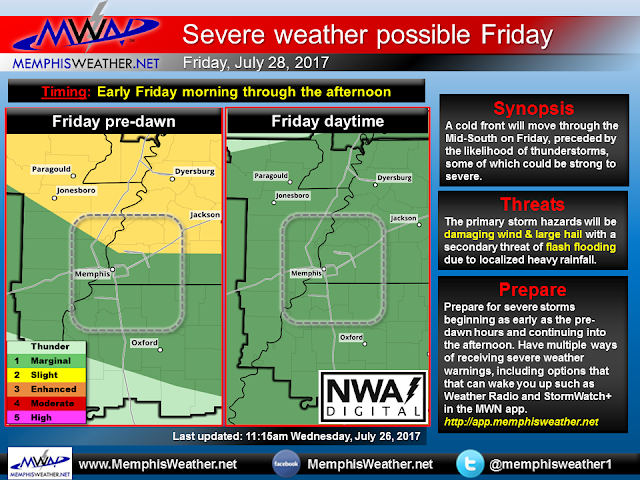 Have a backup plan for any outdoor activities during the PM hours Friday. Saturday could also see scattered showers and thunderstorms, but the highest likelihood will be during peak heating roughly south of I-40, or mainly north MS. Don't plan any outdoor activities the next couple of days without a "plan B" however. By Sunday, we should see a more northerly component to the wind as the front washes out just to our south, resulting in a low chance of precipitation and perhaps SLIGHTLY lower dewpoints. 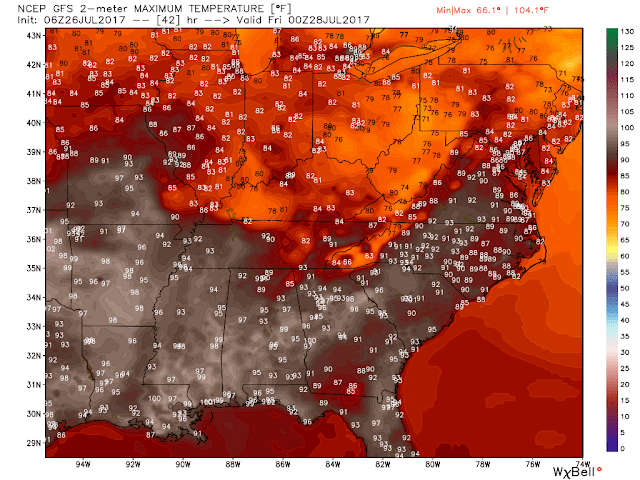 Temperatures this weekend will likely peak near 90 degrees each day. As we head into next week, indications are that the ridge to our west shown in the upper level map above will build east, suppressing precipitation chances and causing temperatures to rise once again, back into the lower to mid 90s. More summertime weather as we work our way through the "dog days!" 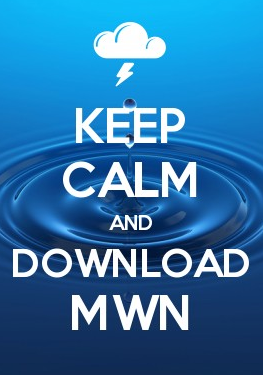 For the routinely updated, human-generated MWN Forecast, check out our mobile apps linked below or click here. For the first time in recent memory, Memphis International Airport experienced consecutive months of below average temperatures in May and June. May 2017 was the first month that was cooler than average in a calendar year and this month was the first June that was cooler than average in 13 years, according to the National Weather Service. 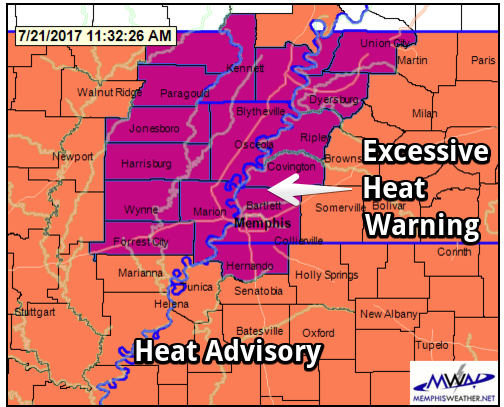 In fact, Memphis usually sees its first 90° reading on May 24 on average, but this year didn't reach that mark until June 6. 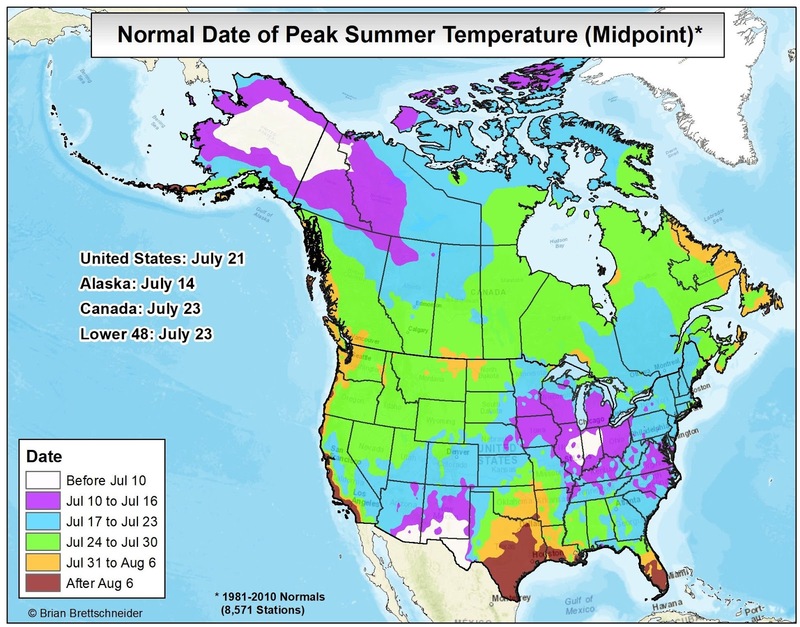 Only eight days recorded temperatures of 90 degrees or higher, which was six below normal for the month and now eight below average for the year. However, for the year, the average temperature is still 3.5 degrees above normal. Radar animation as Tropical Depression Cindy moved across Shelby County on the morning of June 23, 2017. Precipitation-wise, June was a bit wetter than average. Sporadic thunderstorms associated with diurnal thunderstorms provided some rainfall, but the remnants of Tropical Storm Cindy moving directly over the metro on the 23rd provided record-setting precipitation on that day, as well as strong southerly wind gusts. 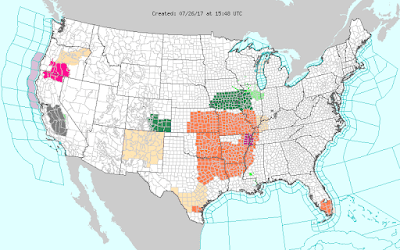 Outside of Cindy, there were a few other severe weather episodes. Hail just below severe criteria fell on the 1st in south Memphis. Wind damage occurred in multiple locations across the metro, mainly in the form of downed trees, on the 18th. Leading up to the arrival of Cindy, a brief tornado touchdown occurred near Red Banks in Marshall County on the 22nd. Finally, on June 30th, lightning resulted in a fatality, a female who was at home in Cordova when lightning struck her home. Comments: Year to date, the average temperature of 62.7° is 3.5° above normal and second warmest on record (2012). Comments: Year to date, precipitation has totaled 23.46" or 84% of normal. Comments: Precipitation on the 23rd was associated with the remnants of Tropical Storm Cindy. When will the wet weather end? Soon! 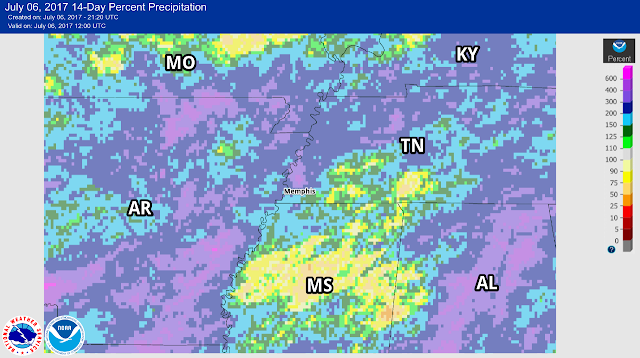 It's been a wet and stormy holiday week around the metro, with plenty of showers and storms that have rolled through Memphis, interrupting some fireworks shows while sparing others. Grass is lush (and tall if mowing has been difficult due to the daily rainfall) and the ground is soggy in some places. But could we see a break in the unsettled pattern coming in the near future? 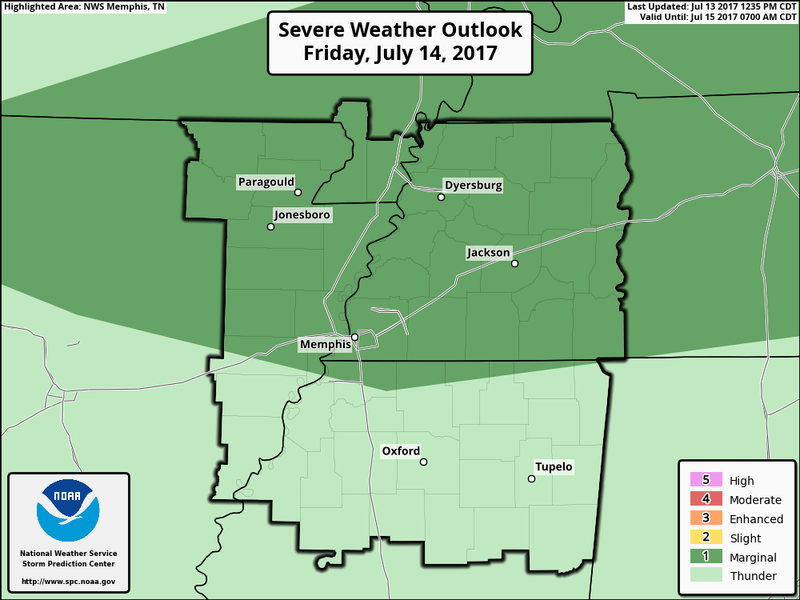 Mother Nature may have some relief for the Mid-South on her mind. 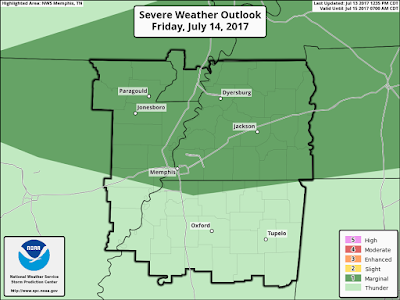 Before the rain can stop, a few more scattered storms are rolling through the Memphis area today. With the potential for showers and thunderstorms out ahead of a cold front digging south, expect to dodge some raindrops this evening when heading out. Once the sun sets, however, expect skies to dry out with mostly cloudy conditions remaining in place overnight with lows in the mid-70s. Friday into early Saturday is the period for this cold front to push through the Mid-South, with a change in the pattern in sight. Your final day of the work week starts out dry and hot, with highs in the low 90s. Then expect increasing clouds into the evening hours before some rain showers roll in for Friday overnight and into Saturday morning. Lows on Friday will be in the mid-70s. Here comes the cold front! By Saturday morning, we expect a change in the weather pattern across the Mid-South. The wet conditions will finally subside on Saturday morning as the showers clear the metro. Left in its wake will be partly cloudy skies and highs near 90 once again. The wind shift from west to north should help usher in slightly less humid conditions, but still plenty of heat to go around. The heat will continue into the next week, with Sunday getting up to near 90 once again. While the overly wet pattern for this time of year will mostly dry out by the end of this week, this will not totally eliminate the chances of rain and storms. With the summertime heat, pop up showers and storms will continue to be possible Sunday and into the next work week as well, especially across northern Mississippi, but they will be much less widespread than the past several days. 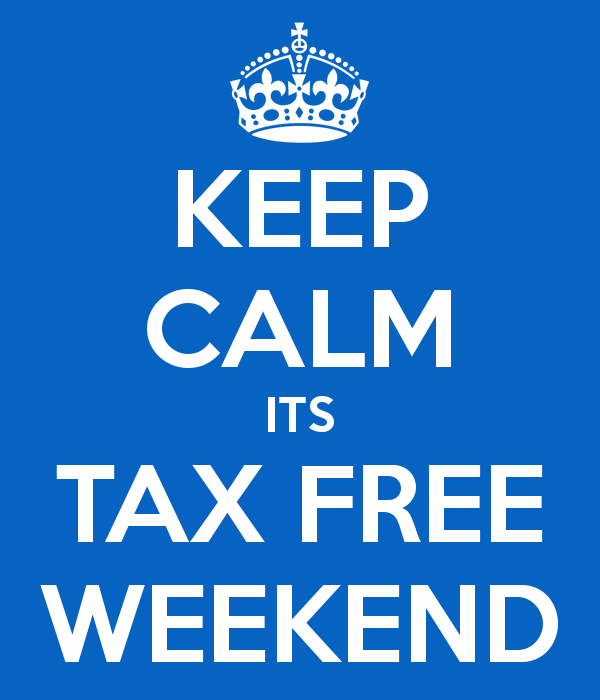 In any case, expect improvement for the coming weekend from Saturday afternoon on through Sunday. As the wet weather rolls through to end the week, be sure to follow us on Twitter and Facebook for the latest updates to our MWN forecast. You can also always check our human-powered forecast on our mobile apps. But it doesn't end there, as you can take MWN with you on the go and check that human-powered forecast on our mobile apps! Hang in there folks, a change in the weather is coming!